War Play, Countdown, and The Outer Limits of Reason, reviewed. 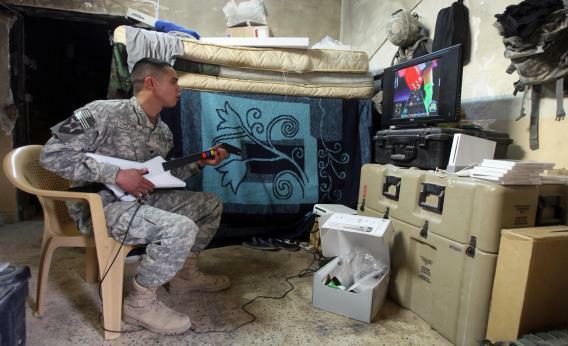 A U.S. soldier plays Guitar Hero on Nintedo Wii in Iraq in 2008. The nutshell: Mead, a professor of English at Baruch College, explores the role of video games in the military-entertainment complex and the influence America’s armed forces have had on the country’s technology and education. Literary lovechild of: Orson Scott Card’s Ender’s Game and James Paul Gee’s What Video Games Have to Teach Us About Learning and Literacy. You’ll find it on your bookshelf if: Your Halo prowess inspired you to enlist. Cocktail party fodder: Edwin Link, the son of an organ and automatic piano maker, invented the first flight simulator—made of wood and powered by organ bellows—in 1926. For optimal benefit: Download America’s Army—one of the most popular online video games of all time and the Army’s most effective recruitment tool—and go through basic training before reading. Snap judgment: By touching on drone warfare only briefly, Mead loses out on lending his book greater relevance, but he has clearly immersed himself in the subject and written the definitive account of gaming in the U.S. military. The nutshell: Journalist Weisman’s follow-up to The World Without Us—which imagined an Earth humans have disappeared from—asserts that population control is the only way we can reverse the destruction we’ve wreaked on the environment and make human life on this planet sustainable. Literary lovechild of: The Worldwatch Institute’s State of the World 2013: Is Sustainability Still Possible? and Susan Greenhalgh’s Just One Child: Science and Policy in Deng’s China. You’ll find it on your bookshelf if: You don’t think your neighbors’ solar panels and Prius are doing much in the way of combating climate change, not least since your neighbor is Octomom. Cocktail party fodder: According to estimates by the United Nations Population Fund and by the Guttmacher Institute, nearly 250 million women who would like to delay or stop having babies have no access to modern birth control. For optimal benefit: If your parents are itching to become grandparents but you have your doubts, put this book under the tree. Merry Christmas. Snap judgment: Weisman’s stories—from his travel to contemporary Israel and Palestine, where reproducing is a form of warfare, to histories of family planning in Asia and South America—are fascinating and often chilling, regardless of whether you agree with his solution to our environmental woes. The nutshell: Brooklyn College and City University of New York computer scientist Yanofsky shows how investigating the impossible—paradoxes of language, problems even the fastest computers cannot solve, and mathematical equations without answers—can help us better understand the possible. Literary lovechild of: Roy Sorenson’s A Brief History of the Paradox: Philosophy and the Labyrinths of the Mind and Deborah J. Bennett’s Logic Made Easy: How to Know When Language Deceives You. You’ll find it on your bookshelf if: When you can’t sleep, you factor six-digit numbers in your head. For optimal benefit: Suspend your faith in reason and settle down for a deeply focused read that will clear things up by leaving them unclear. Hey, we told you to suspend your faith in reason. Snap judgment: Yanofsky makes problems and questions that should make your headache delightful to read and think about. July 2013: Rocket Girl, Future Bright, and People, Parasites, and Plouwshares. June 2013: Viral Hate, The Attacking Ocean, and Me Medicine vs. We Medicine. May 2013: Spam, The Anatomy of Violence, and Arming Mother Nature. April 2013: The Art of Failure, Lost Cat, and Fatal Flaws. March 2013: Robot Futures, Math on Trial, and Can’t Buy Me Like. February 2013: Pukka’s Promise, Entering the Shift Age, and Data: A Love Story. January 2013: Contagion, Mankind Beyond Earth, and Raw Data Is an Oxymoron. December 2012: Saving Babies, Near-Earth Objects, and Learning To Change the World. November 2012: Netflixed, Discord, and Million Death Quake. October 2012: The Launch Paid, Regenesis, and The Digital Rights Movement. September: 2012 Unfit for the Future, Automate This, and This Machine Kills Secrets. August 2012: Resilience, Interop, and Green Illusions.